In this article, you will find information about container seals – the different types, the field of application, as well as, how to seal a container correctly. 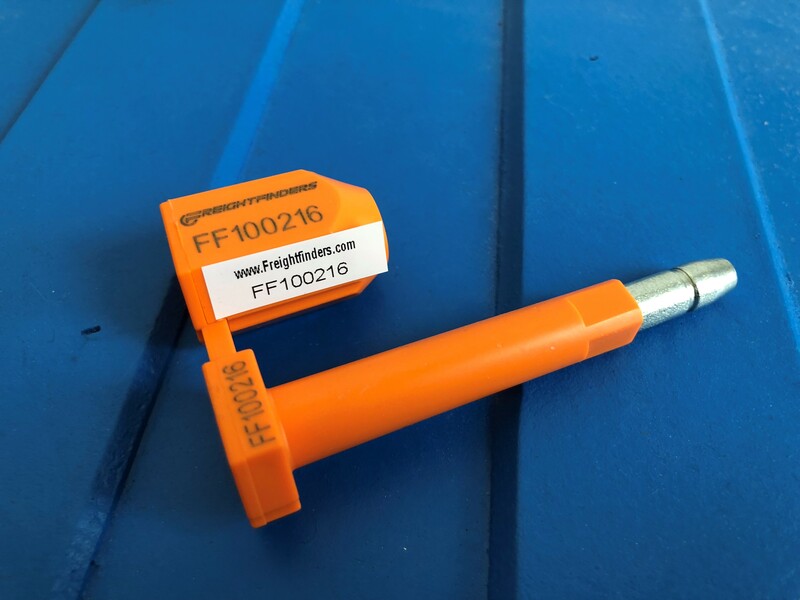 Moreover, at Freightfinders.com you can not only find favourable offers, but also free-of-charge bolt seals with each booking over our platform. Book you container seals via our contact form with the keyword “buy container seal” and name the desired number of seals. Book a transport with Freightfinders & get Container seals for free! Send us your freight informations and ask for a free container seal. There are different types of seals. However, for the shipping of containers, mainly high security seals are used. Container seals are a big security advantage for your transport and are, therefore, today more than ever, an inherent part of modern container transports. The requirements and the nature of security seals are prescribed in the ISO/PAS 17712 (International Standard of Organisation) and are internationally valid. There, you can find mostly technical characteristics, such as the minimum thickness of the steel core, or the results of the load tests. Furthermore, it has been tested, how the manipulation methods can be prevented by the bolt seals’ properties. We at Freightfinders have devoted ourselves to favourable transports and services, which is why, we offer you, beside cheap means of transport and the associated services, free-of-charge seal with every booking over our platform. This means that you do not have to buy additional container seals. Just send us and inquiry and ask for free-of-charge container seals for your transport. Whether it is sea freight, air freight, truck transport, or rail freight – we ship anything fast and safely. Container seals are convenient and cheap ways of protecting your container and goods from manipulation and theft. The particularly safe high security seals made out of steel can only be opened by a bolt cutter, or similarly strong tools. However, they are not only for safety. In a damage case, they can also be handed in as evidence for your insurance. When shipping freight via ship, it is even mandatory to use high security seals for your container. Still, it is highly recommended for every way of transport. Generally, container seals have to meet the ISO/PAS standards, which, as may be necessary, be proven. Separate the bolt from the locking piece at the predetermined breaking point. The eyelets of the container seal should now lie flush against each other. The bolt is now to be inserted from above in the aligning eyelets. Position the locking piece with firm pressure from below all the way to the stop. Now, you can check, if the container is sealed correctly. The task is done correctly, if there are 2-4 mm between the bold and the locking piece and if you cannot pull the bolt out. Check, if the container seal is undamaged. Compare the seal number with the number on your documents. If the container seal is damaged, you are not to remove it without the presence of the responsible commission. You should also enter the whole process in the minutes.